Description: Because the train is coming off double track for the single track bridge, the cars can not be seen. Description: Stainless steel shovel nosed E5ABs were rare when this photo was taken August 21, 1964. 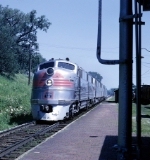 Built in March 1940, this matched pair fly the eastbound Morning Zephyr across northern Illinois through the sleepy town of Chadwick just after lunch and a 129 miles from a bumper post in Chicago Union Station.